Visiting the Gingerbread Castle was a memorable event, but the truly lucky kids got to work there. 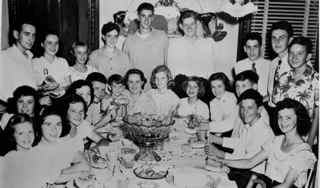 Finding your first job at the Gingerbread Castle in Hamburg New Jersey was a tradition in the community that a special group of kids experienced. For one Hansel and Gretel duo, things were even more special; they were real life twins, working side by side as trusted tour guides, the only pair of twins to play these parts. Janet Baker and Bob Baker were local children who started working at the Castle in elementary school and continued for a few years into High School. Janet, now Janet Baker Rowe, spent time with me in April 2012 sharing her memories. She remembers having to learn the official script and being tested on her presentation by the Castle manager. Lunch breaks were a time to have a terrific burger and a milkshake in the Castle Restaurant. She had fond memories of one friend who also worked as a Hansel; his mother also worked at the Castle and she was the official baker of the Gingerbread. She would package up the cookie-men and cookie-women with broken pieces, and these would be given to the tour guides for snacks. Bob would earn tips sometimes, which was certainly welcomed, since their pay rate was only $1.80/hour to guide visitors through the Castle. Janet does not recall getting any tips, a disparity they still recall today, over 30 years later. Janet treasures many photographs that she has from her time working at the Castle. Other the years, parents taking the tour would routinely photograph Janet with their kids during the tour. Some of Janet’s personal photo collection includes images of Janet and Bob in costume, others photos include visitors to the Castle, as well as treasured images of the Castle itself. Janet has maintained her own original collection of souvenirs after all this time: a small bell, a deck of cards, a ruler, a pennant, a poster, a mug as well as assorted ashtrays, are among the items she stores along with her terrific memories of her family’s experience working at the Gingerbread Castle.